Laparoscopic cholecystectomy (LC) has become the gold standard of treatment of acute cholecystitis due to gallstones. While the injury to the common bile duct during LC has declined, the incidence of lost gallstones has been unchanged. The gallbladder wall in the diseased state is edematous and friable, making dissection challenging. Perforation of the gallbladder can occur during manipulation or traction with grasping forceps and during its extraction through trocar sites. Predictors for the lost gallstones are palpable gallbladder on physical examination, gangrenous cholecystitis, and leukocytosis. Retrieval of spilled gallstones must be performed before they become concealed behind the viscera. Most cases of dropped gallstones during LC remain asymptomatic, but adverse events have been reported with varied prevalence of 0.04%–19% in the literature. Nooghabi et al. reviewed over 250 cases of postsurgical complications due to spilled gallstones, and the most prevalent were intra-abdominal abscess, biliocolocutaneous fistula, liver abscess, and retroperitoneal abscess. 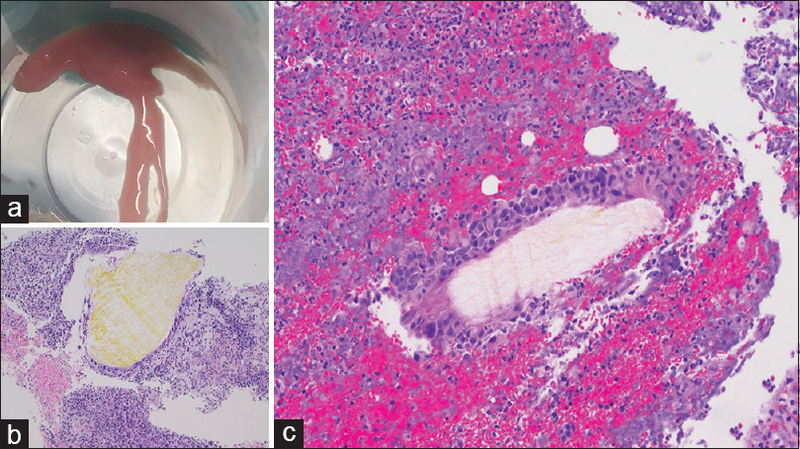 These complications can appear months to years following the surgery.,, We report the case of a 70-year-old diabetic male who presented with a subhepatic abscess 2 years after LC with spilled gallstones. This case is also intriguing as the same organism, Citrobacter koseri, was isolated from a liver abscess when he presented with emphysematous cholecystitis 2 years prior and again in the subhepatic abscess on the current presentation. A 70-year-old male sought care in the emergency room due to 3 weeks of vague abdominal discomfort. He never had a febrile illness, diarrhea, nausea, or vomiting. Two years prior, he had presented with right upper quadrant pain and was found to have emphysematous cholecystitis and a liver abscess [Figure 1]a. Liver abscess fluid grew C. koseri. During the LC, the gallbladder ruptured and numerous stones were spilled. The gallbladder was removed and gallstones were retrieved, and the patient was treated with ciprofloxacin. His medical history also included diabetes mellitus, hypertension, and hyperlipidemia. Physical examination revealed an obese African-American gentleman in no acute distress. His abdomen was tender to palpation on the right upper lateral wall. He was afebrile (97.6° F), and his blood pressure was 99/56 mmHg. The white blood cell count was 7700 cells/mm3, liver enzymes were normal, and glycated hemoglobin was 6.9%. The erythrocyte sedimentation rate was 54 mm/h. Computed tomography (CT) of the abdomen revealed a multiloculated fluid collection, measuring approximately 5.1 cm × 3.1 cm × 7.1 cm, interposed between the right lateral upper abdominal wall and involving the lateral and inferior aspect of the right hepatic lobe [Figure 1]b. CT-guided aspiration of this collection showed a pink-colored fluid [Figure 2]a. Gram stain of this aspirated fluid showed polymorphonuclear cells and Gram-negative rods, and culture grew C. koseri. The antibiogram showed no antibiotic resistance. Blood cultures did not reveal bacteremia. The aspirated fluid also contained a yellow-tan soft-tissue fragment 0.1 cm × 0.8 cm and a granular material 1.0 cm × 0.4 cm. On histological evaluation, a neutrophilic and histioplasmacytic inflammatory cell infiltrate was appreciated along with a foreign body giant cell reaction with entrapped lipid cleft deposits, consistent with cholesterol gallstone fragments [Figure 2]b and [Figure 2]c.
Cefepime was initially chosen as the antibiotic treatment choice and later switched to ertapenem on hospital discharge for simplified once-daily home infusion. Due to recurrence of abdominal pain 10 days after hospital discharge and CT imaging showing the persistence of a perihepatic fluid collection, the patient underwent surgical exploration and drainage. Cultures obtained during surgery did not show any bacterial growth. The patient completed an oral antibiotic course of ciprofloxacin plus metronidazole with a resolution of the abscess. The patient was diagnosed with C. koseri intra-abdominal abscess. This organism was also the culprit for the liver abscess 2 years prior. C. koseri belongs to the family of Enterobacteriaceae and is a colonizer of the gastrointestinal tract of humans. It is considered a low-virulence pathogen; however, it is linked to infections of the urinary tract, abdomen, lung, bone, and central nervous system.,, We hypothesize that the current infectious process with the same offending organism is not a coincidence. The finding of gallstone fragments suggests that the current infection started in the area where a gallstone or sludge was deposited from the ruptured gallbladder 2 years prior. There are published reports of intra-abdominal abscess formation following spilled gallstones during LC.,, The average time of presentation was 4–5 months after the procedure (range, 4 days–30 months). The abscesses were located in the abdominal wall, intra-abdomen, subphrenic, and subhepatic space.,, Surgical exploration identified the retained gallstones at the base of the abscesses. Older age and diabetes mellitus were commonly reported in these cases. Bacterial contamination is seen more commonly with cholesterol stones in clinical cases and also in experimental animal models. Klebsiella species, Enterococcus species, Enterobacter species, Escherichia More Details coli, Serratia marcescens, and Lactobacillus casei were cultured from these abscesses. Acute cholecystitis can be accompanied by bacteriobilia. A recent series of 113 LCs has 28% of positive bile cultures. In the same study, the occurrence of surgical site infections was eight times more common in patients with bacteriobilia. Kimura et al. performed intraoperative cultures after gallbladder perforation during LC. Peritoneal washings were positive for bacteria in 37.9% of cases with gallbladder perforation, and these bacteria were identical with those isolated from the concurrent bile cultures. Therefore, obtaining cultures during LC, when spillage of intra-abdominal contents occur, can provide guidance in antibiotic therapy should postsurgical infectious complications occur. Citrobacter species are known to harbor chromosomal inducible resistance genes that can produce beta-lactamases known as AmpC β-lactamases. This confers resistance to many β-lactam antibiotics. Aminoglycosides, fourth-generation cephalosporins, carbapenems, and fluoroquinolones can be used to treat C. koseri infections. Therefore, a fourth-generation cephalosporin, cefepime, and a carbapenem, ertapenem, were used. An intra-abdominal abscess can be a major complication following an abdominal surgery. Lost gallstones during LC have a low incidence of complications, but can be associated with intra-abdominal abscess occurring days to months after the procedure. Two years prior, our patient had an LC for emphysematous cholecystitis complicated by C. koseri- associated liver abscess. During the surgery, the gallbladder ruptured with spillage of gallstones. Now, our patient presents with a C. koseri-a ssociated abdominal abscess with cholesterol gallstone fragments found in the microscopic evaluation of fluid drained. It is theoretically likely the retained cholesterol gallstone was seeded with the same organism that caused the liver abscess 2 years before, only to reappear as a subhepatic abscess in our diabetic patient. This case illustrates the significance of being mindful of prior surgical complications such as lost gallstones when a patient presents with intra-abdominal abscess even several months to years postoperatively. Zehetner J, Shamiyeh A, Wayand W. Lost gallstones in laparoscopic cholecystectomy: All possible complications. Am J Surg 2007;193:73-8. Jabbari Nooghabi A, Hassanpour M, Jangjoo A. Consequences of lost gallstones during laparoscopic cholecystectomy: A review article. Surg Laparosc Endosc Percutan Tech 2016;26:183-92. Brueggemeyer MT, Saba AK, Thibodeaux LC. Abscess formation following spilled gallstones during laparoscopic cholecystectomy. JSLS 1997;1:145-52. Deveci A, Coban AY. Optimum management of Citrobacter koseri infection. Expert Rev Anti Infect Ther 2014;12:1137-42. Lin SY, Ho MW, Yang YF, Liu JH, Wang IK, Lin SH, et al. Abscess caused by Citrobacter koseri infection: Three case reports and a literature review. Intern Med 2011;50:1333-7. Cai T, Giubilei G, Vichi F, Farina U, Costanzi A, Bartoletti R, et al. Arare case of lethal retroperitoneal abscess caused by Citrobacter koseri. Urol Int 2007;79:364-6. Jain N, Neogi S, Bali RS, Harsh N. Relationship of gallbladder perforation and bacteriobilia with occurrence of surgical site infections following laparoscopic cholecystectomy. Minim Invasive Surg 2015;2015:204508. Kimura T, Goto H, Takeuchi Y, Yoshida M, Kobayashi T, Sakuramachi S, et al. Intraabdominal contamination after gallbladder perforation during laparoscopic cholecystectomy and its complications. Surg Endosc 1996;10:888-91.